I love this initiative and I watched the progress of the team avidly earlier this year. The team at Clover Krush have just announced that they will be spreading more goodness in 2019 when the school year kicks off, by dropping off 20 000 pairs of brand new school shoes to children across South Africa to better equip them for the school year ahead. Now in its second year, the #KrushGoodness project is calling upon South Africans to nominate schools whose children are most in need of school shoes. Nominations are now open and can be made by following the on-pack instructions on promotional Krush products. Krush will go through all nominations and by December 2018, 20 schools from provinces across SA will be selected. These schools will then be visited in the new year where 20 000 scholars will receive their brand new school shoes. Why would a fruit juice brand opt for a school shoes drive, you may ask? The answer is simple. Children represent the future and they represent innocence and goodness, and so if we add a little dose of goodness to make it easier for them to get to school so they can concentrate on learning, it adds goodness into their lives and as a result, to the community at large. Krush is more than just a great tasting fruit juice; it’s a great fruit juice that cares about its community and stands for something bigger. In January 2018, 10 000 school shoes were donated to children in schools across Alexandra, Soweto, Benoni, Emalahleni, Polokwane, Belleville and KwaZulu Natal. 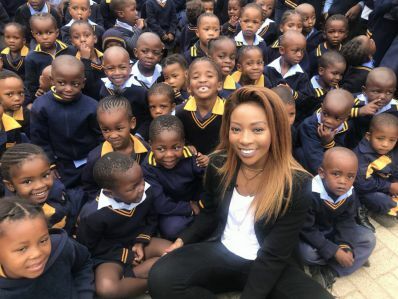 The project was also supported by some of SA’s most-loved celebrities, including: Thembisa Mdoda, Proverb, Bonnie Mbuli, Lalla Hirayama, Nomzamo Mbatha, Lira, Pearl Modiadie, Rami Chuene, and Unathi Msengana. It’s incredible just how fast goodness can spread, even when it begins with one small action from just one person. The fact that we have some of South Africa’s most loved personalities supporting this project once again means that we can spread a whole more goodness a lot further, together.